It's almost here... I can hardly wait for tomorrow to see how our pumpkins will come alive! I made some Devil Seeds (pumpkin seeds with some olive oil, salt, and a little paprika to give them some colour and heat). 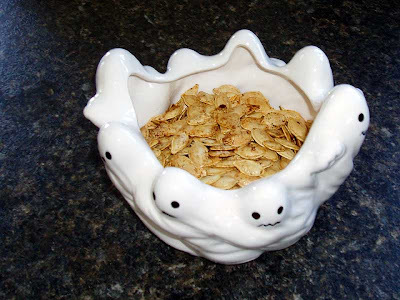 I put them in a pretty Halloween bowl and they look and taste great. They're full of fiber, too. I want too wish my little sister and my sister-in-law both very happy birthdays. Lucky girls, I always wish that I was born at this time of year but no such luck. Anyway, we love you both lots. Enjoy the pics. 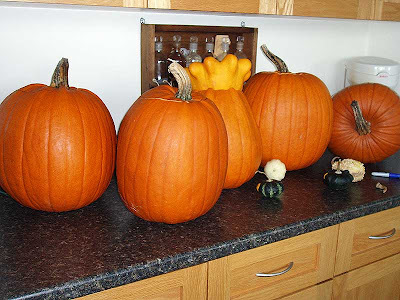 and wait till you see what the finished pumpkins look like. I'm hoping to get my pumpkins carved tomorrow, after the horror movie fest tonight. I like the recipe for the pumpkin seeds! I can't wait to see them carved!